Press petals for paper making or paper crafting. Efficient and expandable, this portable flower press will flatten and dry fresh picked botanicals effortlessly. Quick Dry blotters are super absorbent so flowers are ready to use in minimal time. Instructions tell how to use pressed flowers for crafts and garden maps. Great in the car or trailbag for unexpected roadside stops. 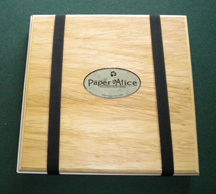 Keep your papers nice and flat with the 12 x 12 Press. Can be used with your 8 1/2 x 11 sizes as well to eliminate the extra cost for a full cranked press. Perfect for pressing leaves and flowers as well! 25 sheets or more can be pressed at once. 10 Blotter Papers are included.